Successful flower gardening in the South means growing plants that can take the intense heat and humidity. A great place to start selecting plants for your Southern garden is by looking at what species are native to your area. These plants have had years to adapt to local growing conditions. Don't let the term "native" scare you into thinking your garden won't be beautiful. These plants are as lovely as they are hardy. Bee balm isn't just a beautiful, repeat flowering perennial plant, it is also an edible flower and a popular herb for making tea. Hummingbirds flock to bee balm's tubular flowers. Cut the plants back after flowering, for another flush of bloom. Blazing Star is a great companion plant to just about anything. The spiky, bottlebrush flowers come in purple and white and stay in bloom for weeks. Expect to see your plants covered in bees, butterflies, and hummingbirds. Once established, Blazing Star plants virtually take care of themselves. Bold and beautiful, Butterfly Weed lights up the garden from mid-summer through fall. The fat, orange, clusters of flowers are truly butterfly magnets. Monarchs are particularly fond of them. These perennials can thrive in even the poorest of soils. Although late to emerge in the spring, they will fill your garden with brilliant color for months. The Carolina Rose is a low growing, fast spreading plant. While it's not suitable for a small flower border, it makes a wonderful low hedge, reaching about 3 ft. high. The single rose flowers are highly fragrant and form very ornamental red hips, in the fall. This is a truly hardy rose, growing in USDA Zones 3 to 9. Carolina Jessamine is a ​free-flowering, evergreen vine that announces spring has arrived in the South. The fragrant, golden yellow flowers can begin blooming even before winter has ended. The vine can be trained to grow on a trellis or allowed to twist itself into a low growing mound of blooms. Crepe Myrtle is not native to the South, but it has been so widely used, breeders are producing plants just for the area. There are dwarf selections that grow to only 3 ft. tall and are perfect for small yards, or you could choose one of the imposing full-sized varieties for a focal point or a hedge. With elegant branching trunks, beautiful summer blossoms and great fall color, Crepe Myrtle earns its place in your garden. Soft white flower bracts cover this native tree, in early spring. While that would be reason enough to grow Flowering Dogwood in your yard, you also get clusters of bright red fruits, in early fall, followed by rusty red leaves. It looks especially eye-catching when allowed to grow as a multi-branched tree. With maple-shaped leaves and tiny, white flowers that clamber up tall, stiff stalks, foam flower can form a fluffy white carpet throughout spring. Here, next to blue pansies, it lights up a shady corner. You may notice a strong resemblance to its cousin Coral Bells (Heuchera), with a similar shape, size, and growing conditions. Foam Flower is also great in woodland gardens and rock gardens. Although not a true Southern native, Hardy Hibiscus has become naturalized in parts of the Southern U.S. and it is commonly associated with the area. It certainly looks at home there. Colors range from pure white to almost black and the flowers bloom continuously throughout the spring and fall. Hibiscus has a tropical feel to them and blends well in the Southern landscape. Oak Leaf Hydrangea is most at home in damp areas of the South, such as ravines, along the banks of streams and in woodlands. This beautiful hydrangea species does have leaves that look like oaks. It also has elegant panicles of white flowers, during summer, attractive peeling branches and gorgeous red and purple leaves, in the fall. Talk about putting on a show. Muhly Grass covers itself with a haze of purple-pink inflorescences. It may look high maintenance, but once established, Muhly Grass needs minimal care. One plant is enough to make a spectacle. Massed in a group, they are a show stopper. Pink Muhly Grass can reach 6 ft. tall and is hardy in USDA Zones 6 to 10. No tree evokes the South like the Magnolia. These large, intensely fragrant trees can grow quite tall - 60 to 80 ft. tall. If you have the room for one, there's no sight more welcome in spring than their 8 to 12 inch, saucer-shaped, white flowers that perfume the whole neighborhood. Thick, glossy, dark green leaves can keep the tree looking attractive all year, where they remain evergreen. Here's a shrub that offers multi-seasons of interest. Spring brings pale yellow flowers, which are showier on male plants (Spicebush is dioecious). But the females claim the stage in fall, with shiny berries that turn from green to yellow to brilliant red, showcased by the golden yellow leaves. This tree stays a compact 6 to 8 ft. in either direction and is hardy in USDA Zones 4 to 9. The white or pink trumpet-shaped flowers are very dramatic, with elongated stamens and reddish-purple styles jutting out of the petals, but it is the heavenly fragrance that gives this native azalea its common name. The vanilla-scented perfume fills the air from spring to late summer. 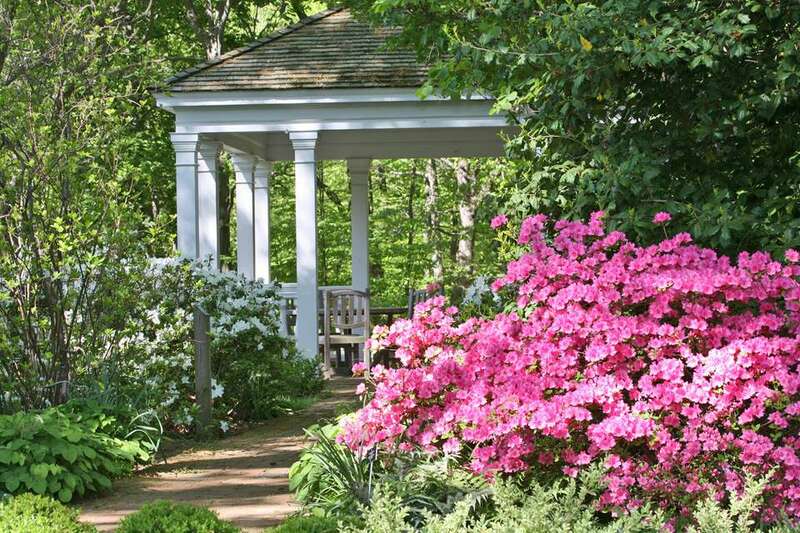 Sweet Azalea is native to the Southeast, but there are plenty of non-native Azalea varieties that grow well there, too. What a surprise Witch Hazel makes, in the fall garden. The frilly yellow flowers appear about the same time the leaves turn golden, making a sunburst effect in the garden, defying the approach of winter. Plant this fall flowering tree where it will get plenty of full sun to allow its branches to spread and open wide.